Because this journey is strengthened by walking, talking and learning with others, Holy Trinity strives to offer a variety of ministries for our members and visitors. We hope you will discover a ministry of your own that will nurture your faith and allow you to help the growth of others. For more information on any of our ministries, please contact our Parish Life Coordinator, Shelley Lackey at plc@holytrinitychurch.info. to accommodate special pastoral events. We work to make our church a place of meditation, peace and joy for all. please contact our chair, Elizabeth Avery, by clicking the link here or call 887-9506. 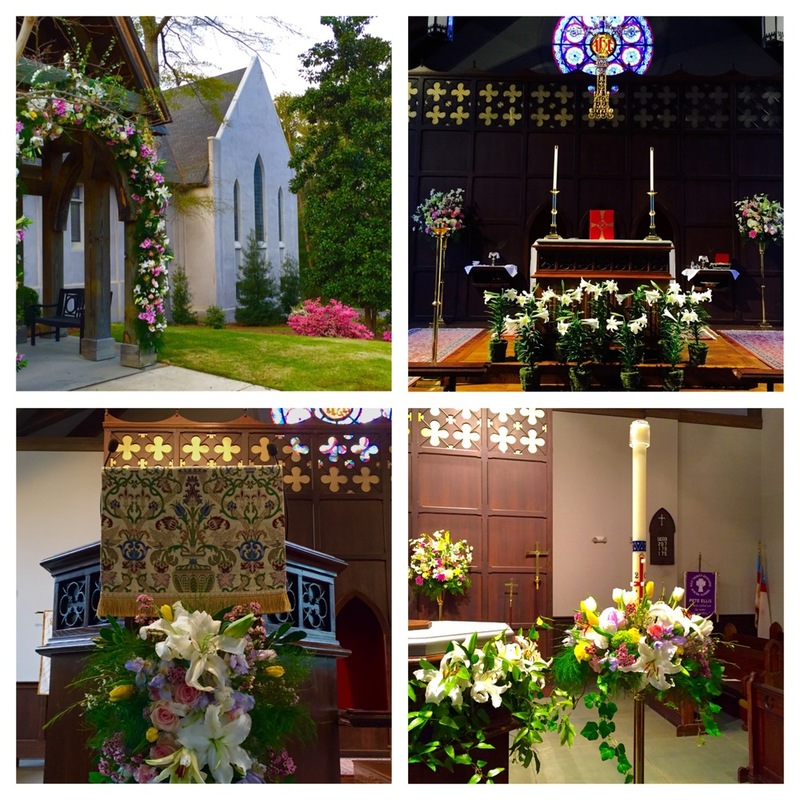 Although the Flower Guild is responsible for decorating the church during special events and maintaining a sign up sheet for weekly flower donations, we believe our most important ministry is the rearranging of the altar flowers following the 11:00 service, and the delivery of these flowers to members of our parish family. Each week members of our guild create small bouquets from the altar flowers and deliver them to parishioners who are sick, grieving, newly baptize or confirmed. Our altar flowers are also used for special community events such as Hospice Memorial Services and the Mental Illness Candlelight Service. or would like to learn more about this ministry, please contact Kelly Shaw by clicking the link here. A Parish Nurse is a licensed registered nurse with a minimum of two years general nursing experience who has successfully completed a nationally recognized Foundations of Faith Community Nursing Course. The East Alabama Medical Center Parish Nurse Program partners with area faith communities to actively support and promote such whole health ministries. There are many dimensions to EAMC Parish Nurses. They play a variety of roles, including educator, health counselor, and advocate in their own faith families. They are a source for preventative and restorative care, ministering holistically to individuals and families. One role parish nurses do not play is that of direct medical care provider. Peggy has been an EAMC Parish Nurse since 2003. She also serves as the EAMC Parish Nurse Program Coordinator and Darden Wellness Center Program Coordinator. Peggy can be contacted here or on her cell at 334-663-1833, or you can visit her at church during nurse office hours on the second and last Sundays of the month between the hours of 8:30–10:00 a.m. Currently EAMC Parish Nurses also serve the community at large. PNs regularly staff the Darden Wellness Center and provide the health curriculum for Christian Women’s Job Corp. To find out more about these ministries, please click on the link provided. BCaB’s Mission is to build Community by Crossing Barriers to make connections, establish relationships, listen and learn, and share and serve. We offer an open invitation to join, visit & engage. Email Mary Lee Carter if you are interested in finding out more. BCaB meets on the 2nd Sunday of every month from 3:00–4:30 pm in the church library. Come join us! Connections is a ministry at Holy Trinity where the goal is to develop and strengthen relationships across generations. We especially want to focus on the challenges and needs of the aging in our congregation and to create opportunities for members to continue to contribute their gifts by engaging in service throughout adulthood. Some of our programs include providing transportation to church services or special events, offering phone calls or home visits, and hosting quarterly luncheons to form inter-generational relationships. The Eucharistic Visitors Team is looking for partners to help them practice delivering communion to those who are unable to make it to our weekly church services. If you are unable to make it to church and would like to receive communion and share time in prayer at home, please consider becoming a Eucharistic partner. Contact Stephanie Ennis for more information (connections@holytrinitychurch.info; 206-218-2148). The Connections Ministry will continue to host Morning Prayer in the chapel at Monarch Estate every Monday at 10:30 am, with the Eucharist being administered on the second Monday of each month. Please also consider joining us for coffee or breakfast on the third Monday of each month at 9 am at Panera Bread. If you would like to participate in Connections, please contact Stephanie Ennis at connections@holytrinitychurch.info. The Meal ministry is dedicated to reaching out and supporting parishioners who are experiencing life changes … happy or sad. Our goal is to serve parishioners at times when it is most important for them to feel the support of the Holy Trinity family. but other times the need is just to receive a card, words of encouragement, a hug, a phone call, a basket of coffee, tea and muffins or a homemade treat. If you are interested in being a part of the The Meal Ministry, please email Melinda Glasscock at melinbrice@gmail.com. The Guild of the Holy Comforter offers a ministry of hospitality to families and friends of the bereaved in the form of receptions with simple refreshments either before or after the funeral or memorial service. No matter the size, we want to make the reception as welcoming and attractive as possible. When there is a death, the clergy will notify the Chair of the Guild of the Holy Comforter, and then that person makes contact with the family to discuss their wishes. Receptions are held in the Caroline Draughan Parish Hall. Please contact Laura Meadows at admin@holytrinitychurch.info if you need more information. The purpose of the ECW (Episcopal Church Women) of Holy Trinity is to relate all women of the parish to the goals of the church through a program of worship, study, service, gifts and fellowship so that each woman may find her place in the parish family and the mission of the church. To this end, we cooperate with the ECW of the Diocese of Alabama and the Episcopal Church of the USA. The ECW gather periodically for projects, fellowship, and fundraisers, and an annual meeting and luncheon is held each year. At this meeting, the members decide with which committee they would like to be involved. All women of the church are considered members of ECW. If you would like more information on this organization, please contact President, Sara Willis at saraelisabethwillis@gmail.com. The Men’s Group is a volunteer group that gathers on the first Thursday of each month at 7 a.m. in the parish hall for a fellowship breakfast and meeting. They also hold social gatherings throughout the year. The Men’s Group helps out with maintenance around the church grounds as needed. This includes yard work not performed by the church’s lawn service, some light construction, pruning and painting as requested. If you are interested in learning more about the Men’s Group of Holy Trinity, please contact Jeff Stallworth at stalljb@auburn.edu. Looking for a way to learn more about Christ and to grow deeper in your faith? Looking for a tool to help maintain a spiritual Rule of Life? Consider attending a Cursillo weekend! Cursillo (Cur–SEE’–yo) is a three–day weekend at Camp McDowell where lay people and clergy share their experiences and perspective on a variety of topics related to the love of God, the Christian life, and the Christian community. The weekend consists of talks, group time, worship, fellowship and fun! Through Cursillo, we seek a deeper understanding of the teachings of Jesus and how we can serve Him. Cursillo starts with a three day weekend, but the best is yet to come! If you are interested in attending a Cursillo weekend or just learning more, contact Mac and Karen Wright or visit the Alabama Cursillo website: www.cursilloalabama.org.